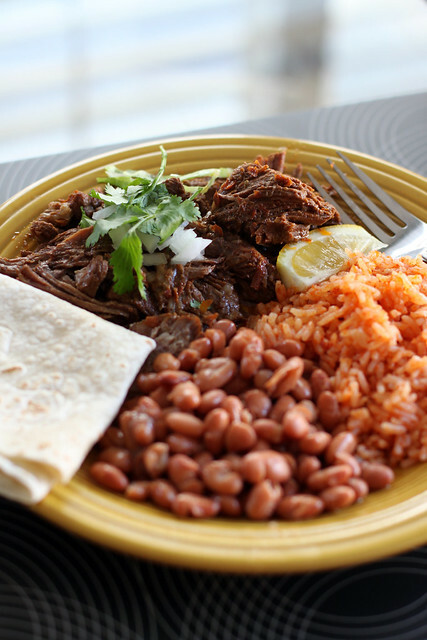 When I dine at Mexican Restaurants or Taquerias, I always look for Barbacoa or shredded beef on the menu. I find that Barbacoa is not as common as other popular meat choices like Carne Asada and Carnitas, so I order it every chance I get. 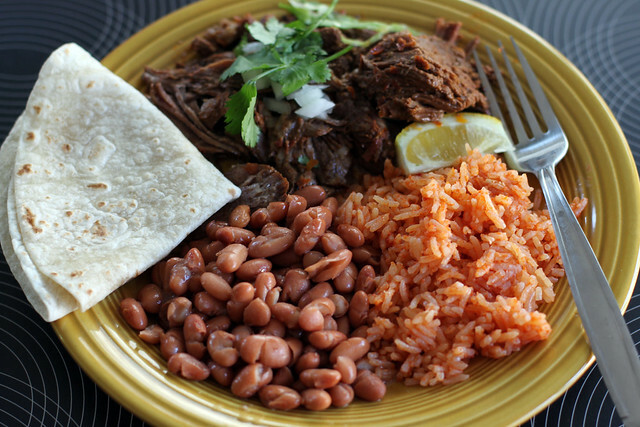 Barbacoa is basically beef chunks that is slowly simmered in a broth of spicy red chiles and fragrant Mexican spices for many hours until it is tender and shredded. I read that in Mexico, Barbacoa is traditionally slow-cooked over an open fire or in pit in the ground. Since those options are unavailable, I relied on my beautiful 6 quart dutch oven I bought at Costco and my oven. 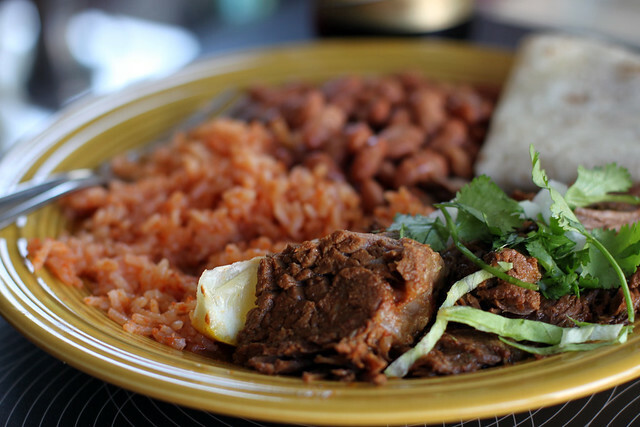 My obsession with Barbacoa started in college when my roommate Ben brought some of his mom’s awesome and delicious Barbacoa after a trip home to Ventura during the holidays. I love how the shredded beef is soaked in the natural and aromatic juices it was cooked in. It is just so darn flavorful and delicious! After a few years of nagging Ben for his mom’s recipe, he finally emailed me the recipe. Because I didn’t have all the ingredients his mom listed in the recipe, I omitted a few things and put my little twist on it. This recipe is very easy to prep and will definitely be a crowd pleaser. To prepare beef, pat dry beef chuck roast and remove excess fat. 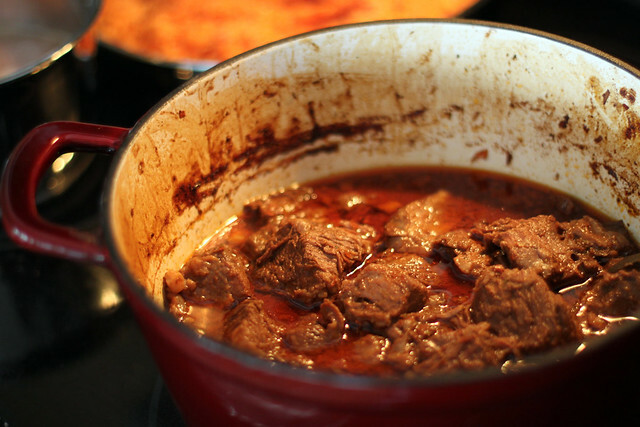 Cut beef into 2-inch cubes and put into a dutch oven. To make marinade, remove stems and seeds from dried chiles and boil in a sauce pan for 15-20 minutes. In a blender, add chiles, garlic cloves, salt, dried thyme, cumin, Mexican oregano, black pepper, ground cinnamon, ground cloves, 2 cups of chicken broth, and vinegar. Blend ingredients until smooth. Pour marinade over beef, add bay leaves and mix well. Allow meat to marinade for at least 3 hours, preferably overnight. Preheat oven to 300 degrees. While oven is preheating, heat dutch oven on stove top over high heat until liquid begins to boil, stirring meat occasionally. Cover dutch oven and place it in the oven and bake for at least 4 hours or until meat is fork tender and pulls apart easily. Take meat out of the oven and allow to rest for 10-15 minutes. Remove bay leaves and skim and discard fat floating on the top of the dutch oven. Transfer meat to a bowl or platter. With a fork or potato smasher, shred the beef. Add some of juice over beef and serve. i call it wine and dine.